CFFC chalked up another golf tournament on September 9th that was a success by every measure. After a chilly start, the sun (and golfers’ spirits) warmed things up quickly. The crew at Southern Meadows Golf Club had the course in perfect condition. We added some additional sponsors which helped us increase our net contribution to CFFC’s programs by more than $1,500. Most of all, we had a lively and congenial batch of 20 golfers. Thanks to one of our new sponsors – Safelite AutoGlass – we added to the winning opportunities in the tournament. 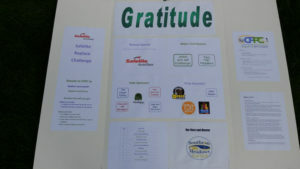 With a contribution of $10, each player had the option of entering the Safelite Replace Challenge. Participants had two shots for closest to the pin on the 115 yard 2nd hole. With a position of 9′ 1″ from the pin, Keith Hoffman won the prize of a new putter. Participants also received three mulligans that could be used for any shot throughout play, with unused mulligans applied to break any ties. Our gratitude goes out to the CFFC Golf Sponsors_2017. In this year’s event we had three major contributors: Safelite AutoGlass, P Gannon Fitzpatrick, and Jackie and Jeff Goldberger. Our prize sponsors were: Otter Lodge, Allan Mason, Marketview Liquors and Wegmans. Our hole sponsors were: the Dwyer Family, Ken and Sue Graham, Walt and Mary McCanna, Sue and Bill Monagan and Plantation Party House. This report would be incomplete without expressing our gratitude to the staff at Southern Meadows for hosting this event, including a delicious lunch featuring grilled filet and roasted corn. PGA Professional Mike Clawson was our coordinator and official scorer. Dan Park (Course Superintendent) and his crew had the course in great shape despite the challenge of dealing with this year’s rainy weather.